UponReflection covers all aspects of runic lore - the rune futharks, a brief history, encryption techniques and how to use them for divination. There is also the oracle where you can cast your runes with a simple click. DUe to several requests a page on Hungarian Runes has been added. 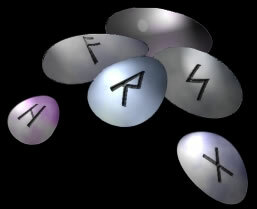 Pages on viking and anglosaxon runes have recently been added. Be sure to check out the latest addition to the site - Associations, here you will find colour theory, tree symbolism and related gems. The site will be updated to cover more divination, spells & curses, rune numerology and healing properties.